There are few better places to learn more about the state of an industry than a trade show. This past November’s Pharma EXPO, co-located with PACK EXPO International 2016 at Chicago’s McCormick Place, offered a firsthand look at some of the changes and new trends that are shaping the drug industry — including new serialization technologies and inspection technologies. Additionally, new processing equipment is being developed to handle the novel biological formulations and personalized medicines that are becoming more prevalent in today’s market. This article will discuss some of the important industry trends I observed on the show floor. One obvious theme was that serialization continues to be a driving force for change in the pharmaceutical packaging segment. A number of suppliers introduced technologies to enable serialized printing on primary packaging and even on finished dosages. New serialized labeling technologies on display included printing 2D barcodes directly onto vials and onto pills and capsules. While these technologies have been more widely adopted in Japan, they seem to be trending ever-increasingly in the Americas. I also saw a lot more small print — literally. By serializing directly onto drug dosages, print is getting ever smaller, presenting a challenge in the industry. While the technology is available to print barcodes on a pill, the technology to read and interpret the information is not as well developed. In the coming months and years, we are likely to see new printing capabilities offered to interpret and track drug dosages with microscopic serialization codes. Miniaturization is not only taking place in printing, but in serialization equipment itself. Traditional barcoding and labeling equipment can take up a significant amount of real estate on the production floor. 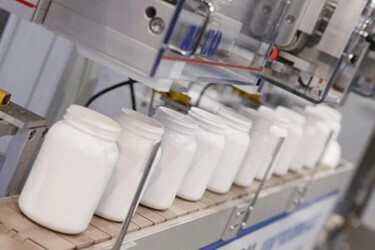 Suppliers have been streamlining equipment design to save space, and it is more common now to find serialized labeling equipment as modular add-ons within a filling line. A continuing challenge for drug manufacturers managing serialization is the navigation of different standards within markets. A single, global serialization standard continues to be an elusive moving target — even for neighboring markets that exhibit only slight differences. This challenge continues to fuel the need for flexible equipment. For manufacturers producing medicines for multiple countries on a single processing line, serialized data needs to vary accordingly. New specialized software can manage this high level of complexity. It’s no surprise that we are seeing more processing software options to help manage and centralize serialization efforts and reporting tools across printing and labeling, vision systems, robotics, etc. Quality assurance through advanced vision and inspection systems was another notable trend. These systems included advances in the inspection of everything from pill forming and proper assembly of capsules to improvements in vial sealing. We are also seeing more capsules being formulated with titanium dioxide because this enables inkless UV (ultraviolet) laser marking on capsules. The rising popularity of new biological drug formulations continues to fuel some unanticipated packaging challenges. These new drugs are quite different from traditional small-molecule formulations, and in some cases, there have been some drug interactions with packaging materials. As a result, we are seeing a demand for new formats and materials. The glass vial is an example of a format that is undergoing changes that reflect market demands. Some novel biologics have properties that delaminate glass, leading to unwanted glass flaking in solutions. Manufacturers are now looking at how vials are formed in the heating process so that flaking can be mitigated. Another common medical device that is undergoing intense scrutiny is the prefilled syringe. Some new medications have reacted to components in syringes, requiring manufacturing changes. Silicone oil, for example, has long been a staple form of lubrication for syringe plungers. However, instances of protein drug denaturation and aggregation have led to a rising demand for low-silicone or even silicone-free syringes. Another contaminant, tungsten, used in forming the glass syringe tip, has also been found to cause denaturation and aggregation of some protein drugs, leading the industry to search for tungsten-free syringes. A decade ago the pharmaceutical industry’s primary goal was to handle bigger production lines and attain exceptional productivity and product throughput. Today the industry is singing a different tune. We are seeing filling lines that are smaller, more modular, and flexible, with shorter lead times. The primary industry drivers for this move away from the big factory model has been the growth of personalized medicines, the need for smaller batches, and the increase in regionalized manufacturing markets. A good example of this trend is vaccine manufacturing, particularly in underdeveloped markets. Some years ago, there was a disruption in the global flu vaccine supply due to equipment cleaning issues. This led to more localized vaccine manufacturing and greater use of single-use components. The industry has come to view regional vaccine manufacturing as more cost-effective and ultimately safer. It eliminates some of the logistical headaches associated with getting vaccines to other countries with limited infrastructures and, in turn, has led to the growth of more modular production facilities. In short, the industry is moving away from the big factory model. Today we see more off-the-shelf performance modules that enable drug manufacturers to select components with shorter lead times. This also aligns with the growth of personalized medicines in which batches are smaller. Along with modularity is the trend of equipment with toolless change-outs. Being able to pull out components and replace them quickly is partly the result of the rise of single-use modules. It is a trend that keeps downtime to a minimum. You can witness new trends in pharmaceutical processing and packaging firsthand at PACK EXPO East 2017. The three-day event will feature 400 mostly East Coast exhibitors spanning more than 100,000 net square feet, with an anticipated attendance of 7,000. The event includes the Healthcare Packaging and Processing Conference, which offers sessions and technology workshops that cover serialization, machinery automations, logistics security, government regulations, innovations in biotech and pharmaceutical packaging, sustainability, and more. PACK EXPO East 2017 will also feature an Innovation Stage program showcasing many of the latest packaging advances. These free 30-minute sessions on the show floor provide a quick and convenient way to learn about key topics. For more information or to register, visit packexpoeast.com.